The Irish Residence Permit (IRP) is your registration certificate. You will be given an IRP whenever you register with immigration. Your IRP is a very important document and you must carry it with you at all times. NOTE: From 11 December 2017 the previous registration certificate (GNIB card) has been replaced by the new Irish Residence Permit (IRP). Do not apply for an IRP until your current GNIB card expires. The IRP is not an identity card. It is a registration certificate. It is not valid for any reason except to certify that you are registered with immigration in Ireland. You must carry your IRP with you at all times and present it to an immigration officer or a member of An Garda Síochána (police) if requested. This includes whenever you leave or re-enter the country. The IRP does not give you any new rights or entitlements. For example, an IRP does not allow you to travel to or live freely in other EU countries. All existing travel and immigration rules still apply. It is your responsibility to check what you need to enter other countries before you travel. If you are a non-EU/EEA and non-Swiss citizen and you wish to stay in Ireland for any reason for longer than 90 days, you must apply for immigration permission and (if successful) then register. If you wish to stay in Ireland past the expiry date on your IRP, you must apply to extend your immigration permission and renew your registration. If successful, you will be given a new IRP. An IRP costs €300 per person every time you register and renew. You may also have to pay for a new IRP if your current card is lost or stolen. The process for issuing Irish Residence Permits (IRP) is different if you register in Dublin or outside Dublin. If your register in Dublin, the immigration officer will arrange to send your IRP to you by post. Your IRP should arrive within 5 to 10 working days. If it does not arrive within 10 working days, contact us. If your register outside Dublin, the immigration officer will arrange a date/time for you to return to the registration office to collect your IRP. You cannot get an IRP during your first visit to a registration office outside Dublin because parts of the process are managed centrally. You must return to the registration office to collect your IRP. In some cases, we may issue you with a new Irish Residence Permit (IRP). Contact us to update your registration details. You must contact us if your Irish Residence Permit (IRP) or GNIB card is lost or stolen. You must also contact us if you were issued with a new IRP by post in Dublin, but it did not arrive after 10 working days. We will then investigate and (if necessary) prepare a replacement for you. 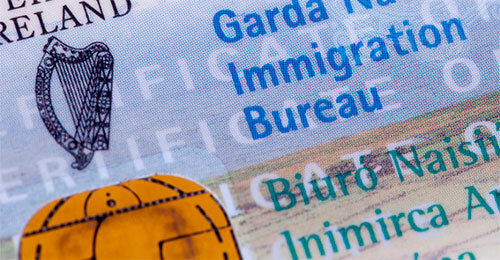 From 11 December 2017 the previous registration certificate known as the ‘GNIB card’ has been replaced by the new Irish Residence Permit (IRP). The new IRP has exactly the same legal status as the old GNIB card. It does not give you any new rights or entitlements and your responsibilities stay the same. Do not apply for a new IRP if you currently hold a valid GNIB card. Wait until your GNIB card expires (or is lost or stolen) and then apply as normal. If successful, you will then be given a new IRP. Read more about replacing the GNIB card. IMPORTANT: Do not apply for your Irish Residence Permit (IRP) until you need to renew. Your existing registration certificate (GNIB card) remains valid until it expires (or is lost or stolen).